You are here: Home / Dressage / How Do I Get My Horse To “Go”? How Do I Get My Horse To “Go”? The first thing you need to do is teach your horse to take responsibility for his energy. It’s not your job to keep him going by “legging him”, spurring him, clucking constantly, or pushing with your seat. To begin to teach your horse to take responsibility for his own energy, walk very actively. (Get the walk active any way you can at this point.) As soon as he slows down even SLIGHTLY, correct him by tapping with the whip or giving several sharp kicks until he trots. Then go back to the walk. If he keeps walking actively on his own, praise him with your voice. The moment he even thinks about slowing down, correct him again. Praise him with your voice for as many strides as he takes without any help from you. 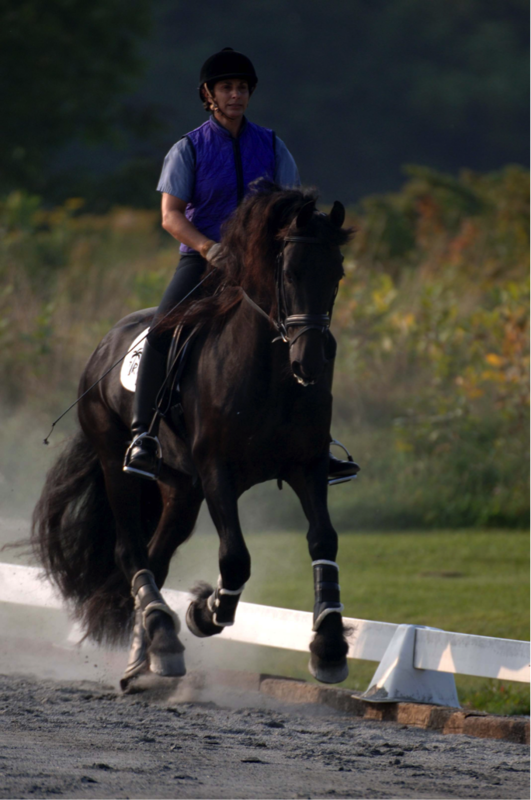 Once your horse takes responsibility for his energy and goes on his own, the second part, of teaching him to “Go” is to educate him to the driving aids. 1. Give a very light aid. Remember that your horse can feel a fly on his side. 3. Instead, correct him by tapping with the whip or giving several sharp kicks. 5. If you find yourself saying, “That was better”, or “pretty good”, or “good for him”, correct him again. If you don’t, he’ll just get progressively lazier. Some people think it’s harsh to “correct” a horse by kicking or tapping with the whip. But at the end of the day, it’s a lot kinder and more pleasant to train your horse to take responsibility for his own energy and to react to light driving aids than to nag, squeeze, and spur him every stride. Jane, I,, too was stunned by your mention of cancer. Please know that you, Moshe, Indy and Rhett have given me and my horses endless hours of help and fun. I have your books and DVD’s for which I am most grateful. I will be sending you all the energy of peace and healing. I, too, Jane did not know about your cancer. Be sure to use your strong, nagging aides while fighting this dreadful disease — I know you will win!!! You are in my prayers, and you know Jan is up in heaven routing you on! I am a middle age guy who took up horseback riding relatively late in life. Although I have more of a passion for jumping, dressage is the base where all horsemanship begins, so I am a sponge for what you have to teach us about riding. Your inspiration supersedes riding as it is a roadmap for how to live life. You press on and know that people you have never met are thinking about you. Congratulations to you Jane for all your success in everything you touch and do. You are a wonderful, helpful, supportive person. You have such a beautiful spirit and are so generous with your knowledge. Thank you for sharing with us all the good and all the challenges. I will pray for you as I know the power of prayer can bless and heal. I pray for a full recovery, renewed health and the strength to carry on as you start each new day. Thank you for this article! My beloved Friesian gelding is quite a lazy boy, and I am struggling with this issue! Will be changing a few things now! Also wanted to send you encouragement as you go through your cancer treatments – as a fellow survivor I can tell you’ll do well – you have a positive attitude, and the best place to visit when you’re tired – the barn! Jane, So sorry to hear about your cancer battle. You have inspired me through your emails, videos, and books. My current horse is my ‘therapy horse’. Got him 1 month after my final surgery. It’s a long road to healing but I’m living it while continuing treatment. Prayers for strength and healing! Thank you for your training and your positive attitude. You are an inspiration to riders all over the world. Prayers for your healing and happiness. Thank you for all the help you have given me with my problems with my kwpn.I am so sorry to hear about your awful struggle but you are a great woman and you will ein this battle we are all praying for you dont worry soon you will be fine. A friend of mine recently shared this with me. I thought there was a lot of good information in regards to cancer treatment and I’m sure it inspires hope for those fighting cancer. I wish you the best and that you have a full recovery. Thanks for sharing your horsey knowledge, I’ve definitely benefited greatly from your videos, etc. So sorry to hear about your cancer. I went through breast cancer and if it wasn’t for my horses and animals.I don’t know how things would have turned out. Sending many positive thought for your full recovery. Hug a horse it helps. I do love all you have put up about horses.